Aviva Premiership Rugby club Harlequins have announced that England full-back Mike Brown has committed his long term future to the Club. Brown has been with Harlequins for over 15 years and after joining through the Academy set up and making his debut for the club in 2005. Commenting on the news the 30 year-old said: “I am delighted to sign a new contract with Harlequins. “I believe we have some exciting times ahead of us with the new guys coming into the Club this season and the young talent coming through from the Academy. By re-signing, the one-club man will have been at Harlequins for well over 15 years when his new contract expires, having joined the Academy set up in 2002. Brown, who is a Harlequin through and through, is one of the most exciting full-backs in world rugby; his aerial presence, line breaking ability and passion is second to none, which has made him a lynchpin for the Harlequins and England backlines in recent years. Since making his senior Harlequins debut in 2005 he is currently the most experienced back within the squad with 248 appearances to his name, and 79 tries. After representing his country throughout the age grade levels, Brown made his senior England debut during the 2007 tour to South Africa and had three caps to his name by 2008. Having played an integral role in Harlequins’ Amlin Challenge Cup and Aviva Premiership winning seasons, in 2011 and 2012 respectively, and having previously represented the Saxons, he was called into Stuart Lancaster’s squad for England’s 2012 tour of South Africa. Since then, Mike’s domestic and international career has rocketed. During the 2013/14 season he was named QBE Player of the Series, RBS 6 Nations Player of the Tournament, The RPA’s England Player of the Year and the Aviva Premiership Player of the Year. Following his participation in Rugby World Cup 2015, the full-back can now boast 43 international caps. 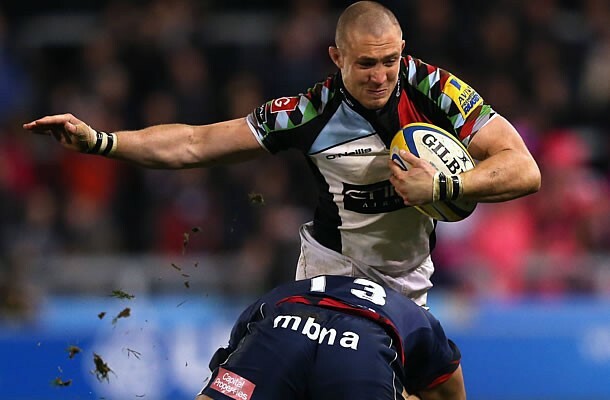 Brown, a former Peter Symonds schoolboy, is a fierce competitor on the field and an excellent ambassador for Harlequins away from it and the Club is delighted that Mike has decided to commit his long-term future to The Stoop. Harlequins Director of Rugby, Conor O’Shea, added: “Mike is the epitome of what Harlequins stands for; he has come through our Academy and become one of the great full backs of world rugby.